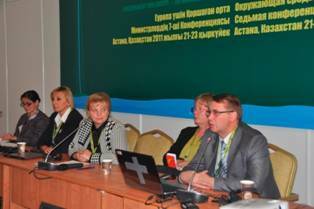 Overall goal: To advance ongoing efforts to eliminate toxic substances in toys on the market in Armenia, Kyrgyzstan, Russia, Belarus and Ukraine by 2020 and contribution into SAICM implementation in the targeted countries by initiating the development of a global information system on chemicals in toys. An assessment report was developed based on literature review and analysis of manufacture, export/import of toys, legislation, labeling related to toxic chemicals in toys and marketing research in Armenia and Kyrgyzstan. Research revealed that the number of imported toys exceeds the number of exported toys in targeted countries. Toys in the largest quantities are imported from China in both countries. In Armenia, there is only one certified toy manufacturing enterprise and a few small toy companies that are not certified. During the visits to all branded stores AWHHE met with the store managers, sellers and buyers. AWHHE reviewed a range of toys and checked the availability of certificates on packaging, labeling and safety. The toys in branded shops were in packages and had labels. The labels contained the signs of international standardization. Therefore, all toys both produced in Armenia and imported that are sold through the registered stores have appropriate documentation. As for the toys sold by individual sellers in fairs, the majority of them have no certificate in Armenia as well as in Kyrgyzstan. In addition, the Kyrgyz experts faced difficulties with the survey of sales representatives. The respondents (in stores and markets) refused to answer questions, citing various reasons. Survey was conducted among parents and teachers of kindergarten and consumers in Kyrgyzstan and Armenia. According to the results of the survey, the number of consumers purchasing toys from the fair trade points exceeds the number of people making a purchase from the branded stores, as the toys in shops are more expensive than those in the fairs in both countries. All the respondents in both countries indicated that the market is dominated by Chinese toys. Most often the consumers complained of the following: bad smell, “easily crumbled”, “electrical disturbance”, “flammable” and color loss. This means that many children are at risk of being exposed to hazardous toys. 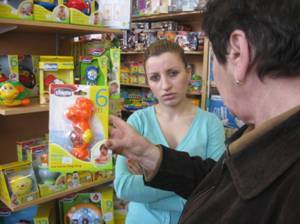 Of the surveyed parents in Armenia, 64,7% pay attention to the labeling of toys. Twelve 12 samples of toys were submitted to the laboratory of the Kyrgyz State Sanitary and Epidemiological Oversight Department. Due to lack of capacities and human resources the laboratory was able to check on the following: styrene, phenol, formaldehyde, methyl alcohol, resistance of the coating to wet processing, saliva and sweat and compliance with the design. Deviations from the hygiene standards were identified in five samples, where the content of the above toxic elements exceeded the maximum permissible concentration of 5 or more times. Information and awareness raising campaign implemented in the frame of the project targeted the toy consumers, regulators, producers and vendors. Information materials were created and disseminated at the relevant national and international events on chemicals management, environment and health issues. Articles were published about the toys security in Armenian electronic newspapers. Taking into account the high potential risk and high vulnerability of children to chemicals through contact with toys the IEE together with Eco-Accord and several more non-governmental organizations initiated a campaign on “Toxic Free Toys”. As a result, several thousand signatures were collected in September 2011 with 800 signatures collected in Kyrgyzstan alone in support of safety of toys campaign. On May 31, 2011 IEE sent an appeal for improvement in the safety of toys to the President, the Speaker of Parliament, the Prime Minister with the above 800 signatures of the citizens of the Kyrgyz Republic. In addition, IEE prepared a petition for recognition of the law contrary to the KR Government inaction, and in July 2011 it was filed in Inter-district Court of Bishkek. During the reporting period toys were purchased from markets and specialized stores in Armenia and Kyrgyzstan. The analysis on chemicals, especially heavy metals in toys will be conducted in 2012 with the support of IPEN. The toys will be analyzed with the help of a portable X-ray fluorescence analyzer.